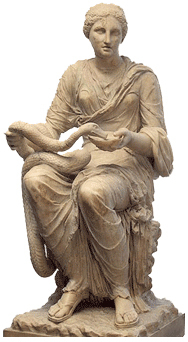 In Greek mythology, Hygeia was a daughter of Asclepius, the god of Medicine. Hygeia was differentiated from her sister Panacea the goddess of medicinal cures in that Hygeia espoused healthy lifestyle decisions and prevention measures. In the context of the diabetic scourge this country is facing we embraced the concept that people’s lifestyle decisions impact their health and inspired by Hygeia’s example, with education and encouragement we might make a difference.